Meanwhile, in medium bowl, combine beef strips, sugar, five-spice powder, soy sauce and garlic; mix well. Let stand at room temperature for 10 minutes to marinate. Heat oil in large skillet or wok over medium-high heat until hot. Add beef with marinade; cook and stir 3 to 5 minutes or until beef is browned and of desired doneness. Remove beef from skillet; cover to keep warm. Reduce heat to medium. Add celery, carrot and onion to same skillet; cook and stir 5 to 7 minutes or until crisp-tender. In small bowl, combine broth and cornstarch; blend well. Add broth mixture and cucumber to skillet; cook and stir until sauce is bubbly and thickened. 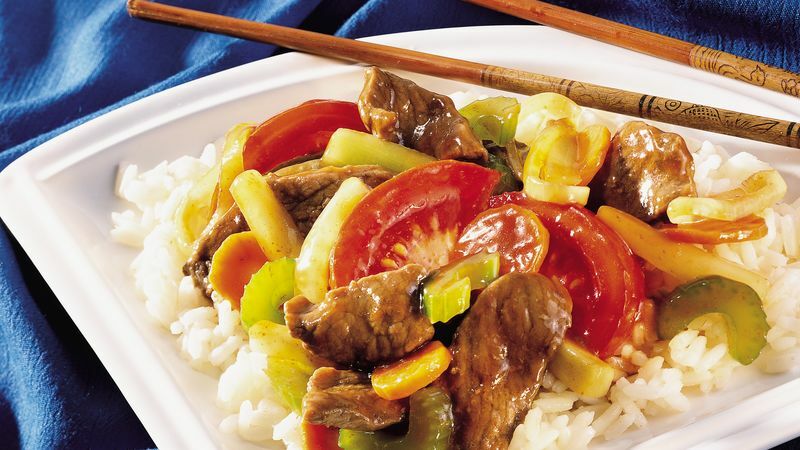 Stir in tomato and beef; cook until thoroughly heated. Serve over rice.